Casa Santa Margarida is a cosy single storey granite restaured villa with a small pretty garden planted with hydrangeas and an orange tree providing natural shaded. It is set in the grounds of a fifty acre estate where there is also a 17th Century Manor House with its own private chapel and two small cottages adjoining, all in beautifully maintained grounds. Guests staying at Casa Santa Margarida have to share the outside facilities with people staying in the cottages. The interior of Casa Santa Margarida has been carefully furnished in traditional style creating a comfortable and relaxed environment. The open plan sitting/dining room has French doors that open onto the patio. The country style kitchen, with a traditional bread oven, is fully equipped with modern appliances. There is a double bedroom, twin bedroom and a bathroom. There is also a twin bedroom with ensuite bathroom. There is a separate laundry room with washing machine and ironing facilities. In the grounds there is a tennis court, swimming pool with changing facilities, sun loungers and umbrellas. There is also a patio with garden furniture. Approximately 10 kms to the west of Casa Santa Margarida is the Atlantic Ocean with golden beaches and spectacular sunsets. Ten kilometres north of Santa Margarida is the lovely old sailing port of Viana do Castelo with cobbled streets, a medieval square and magnificent merchant houses. It is an excellent place to sample the locally caught fish accompanied by the famous Vinho Verde, a light semi sparkling wine. Approximately one hour away is the only National Park, Peneda Geres in Portugal, with its granite mountains stretching across to Spain. Reaching heights of 4000 feet, it is fantastic walking country with far reaching views to the ocean and Spain. Other sight seeing excursions include the walled town of Valenca and on to Vigo, Baiona and Santiago de Compostela in Spain. Also the Portuguese cities of Braga, Guimaraes and Porto. The recently expanded airport at Porto is within easy reach by car. Low fares to this airport are now offered by a number of airlines. Alternatives, are the Spanish airports of Vigo and Santiago de Compostela which are reached by motorway. The local festivities are held on the last weekend of July. For larger groups, Casa de Sao Cristovao is close by and can accommodate a further 10 persons. Comment posted by S. S.
I stayed at Casa Santa Margarida in August and would like to say how much my family and I enjoyed our visit. 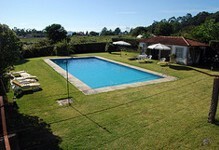 The area is beautiful and the hosts, Mr and Mrs Barbosa, could not have been kinder or more helpful.